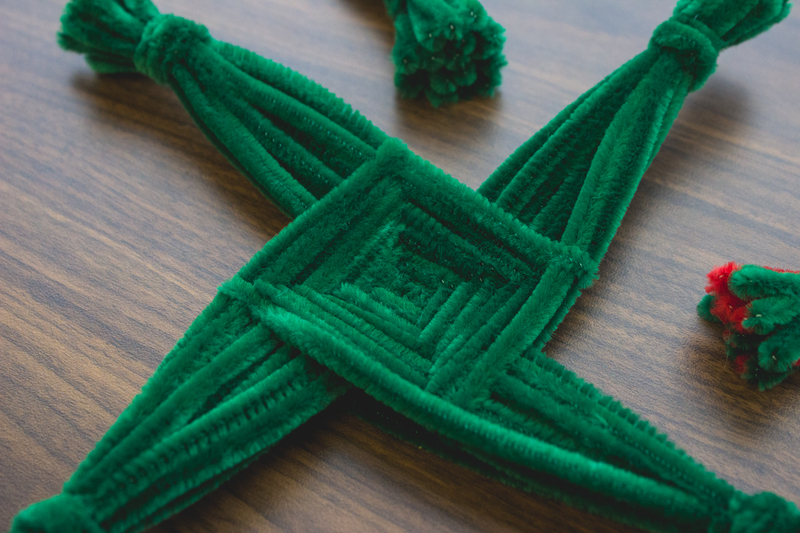 Saint Brigid, who was born in ancient Ireland, grew up to be one of Ireland’s most beloved saints. 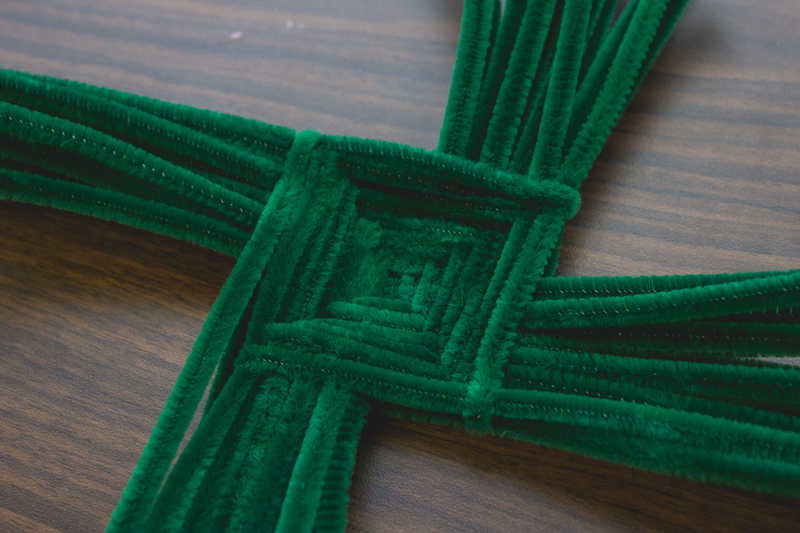 A common story about St. Brigid is that she used an ancient Celtic symbol, now known as St. Brigid’s cross, to teach a pagan Chieftain on his death bed about Christianity. Because of her words, he was baptized before he died. 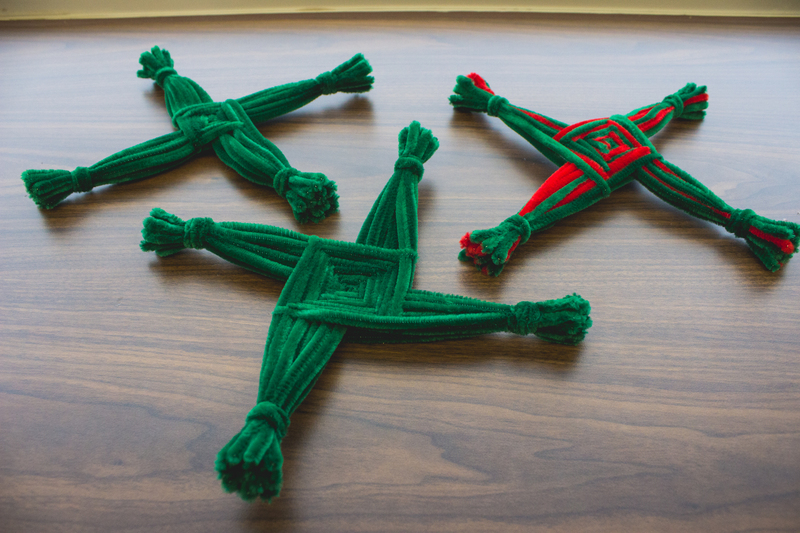 These crosses are often hung above windows and doorways in Ireland to protect against evil. 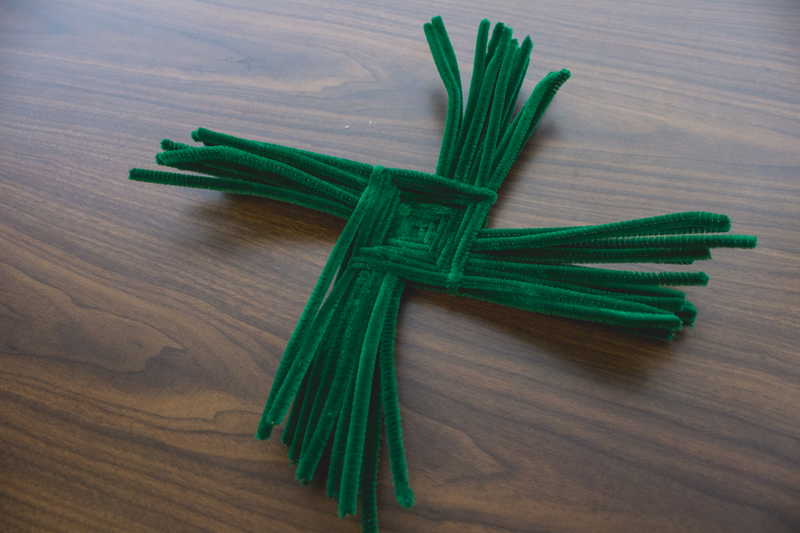 To make a cross in the style of St. Brigid, all you need are 34 pipe cleaners (more or less, depending on how big you want the center of your cross to be). 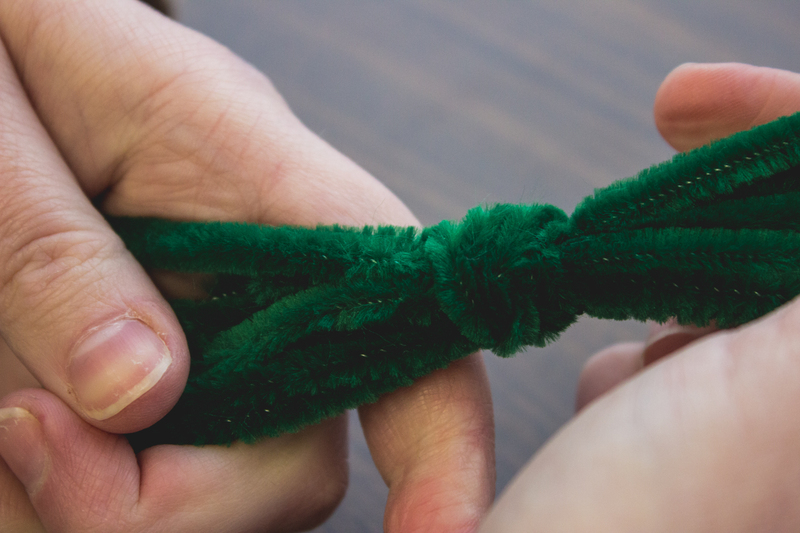 Step 1: Take a pipe cleaner and bring the two ends together. 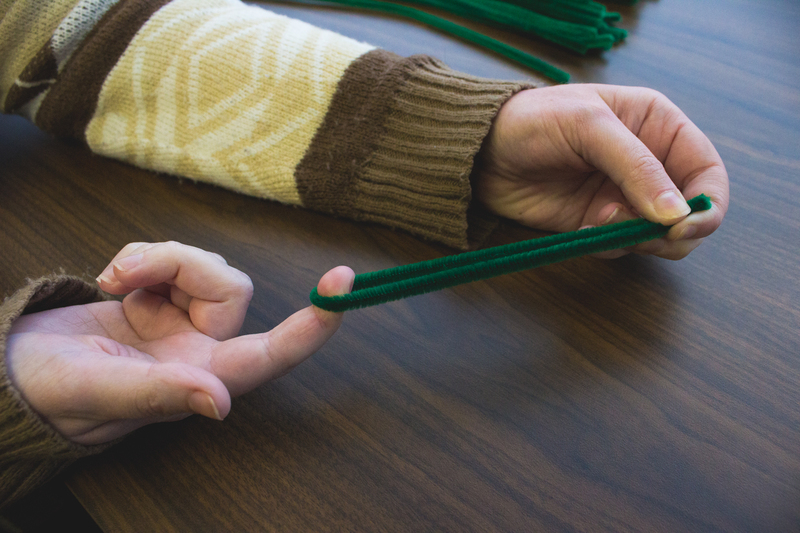 Put one finger though the loop and pull down. 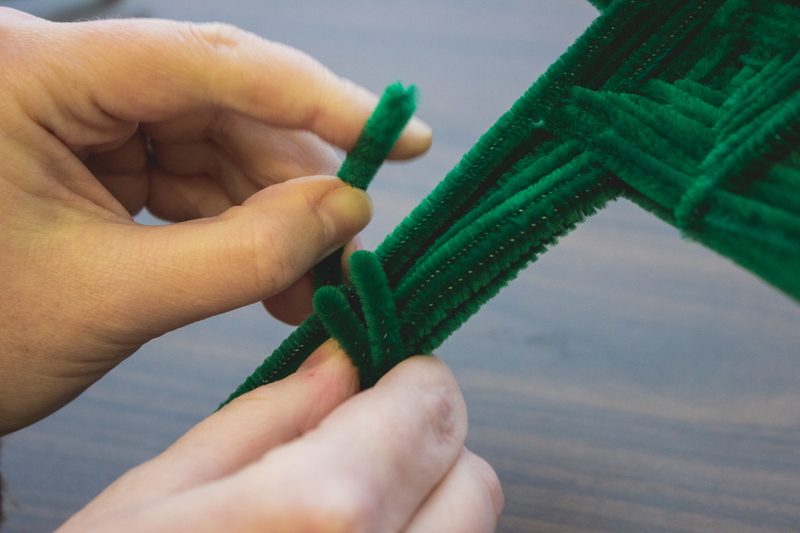 This will create a V shape with a rounded bottom. 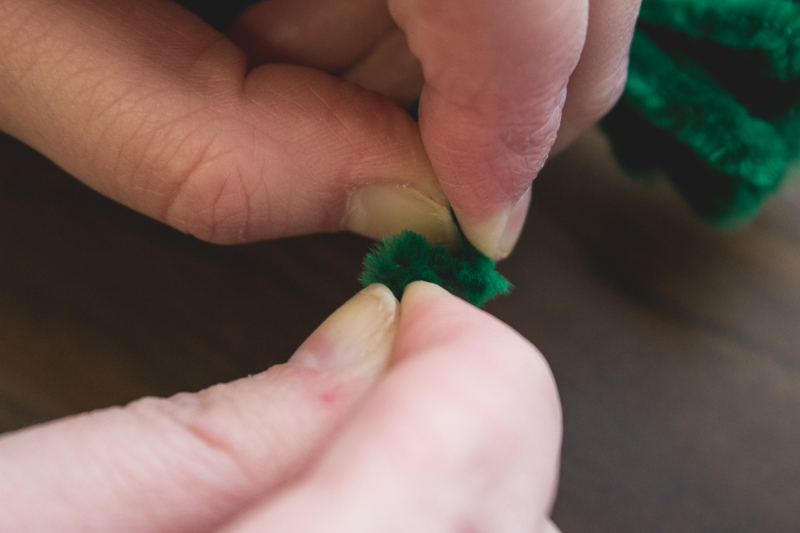 Repeat this process with all but 4 pipe cleaners. 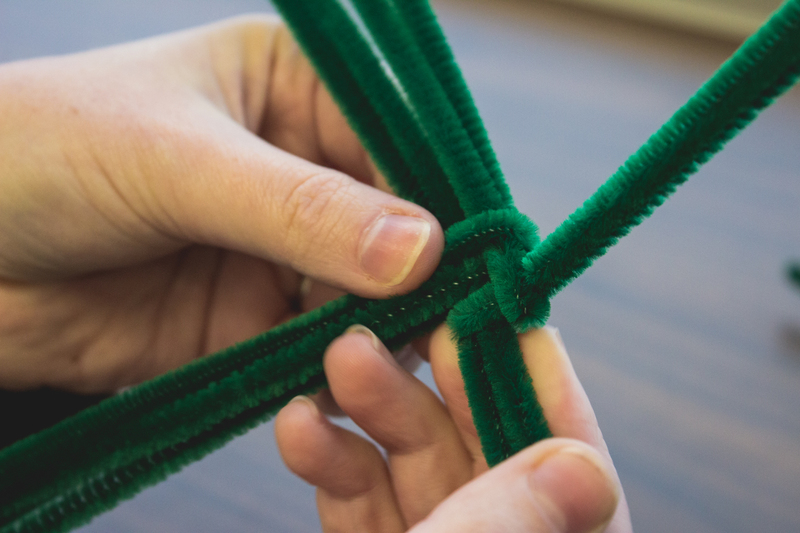 Step 2: Take two pipe cleaners and insert one inside of the other so the bottoms of the Vs are crisscrossed in the center. 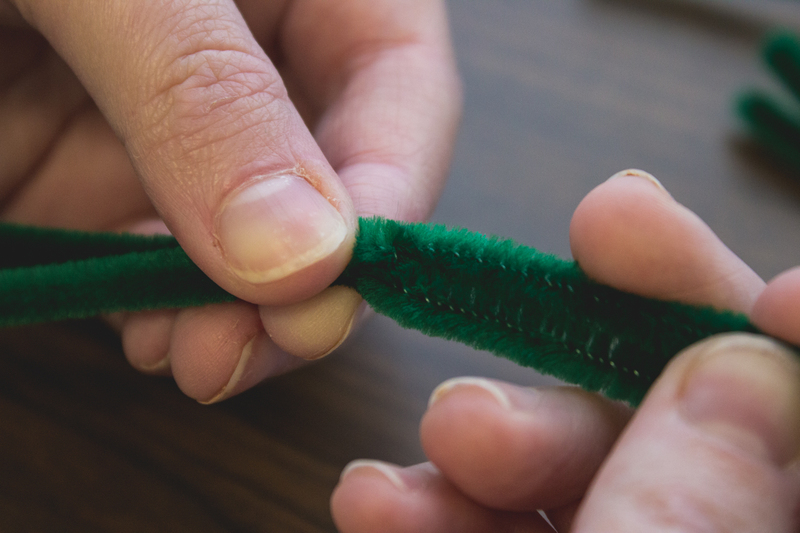 Pinch the curved ends of both pipe cleaners together to flatten them. 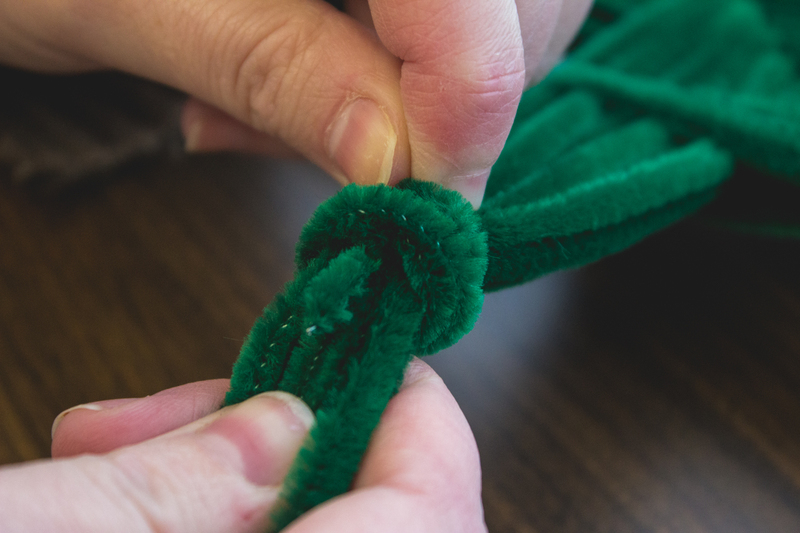 This will secure the two pipe cleaners together. 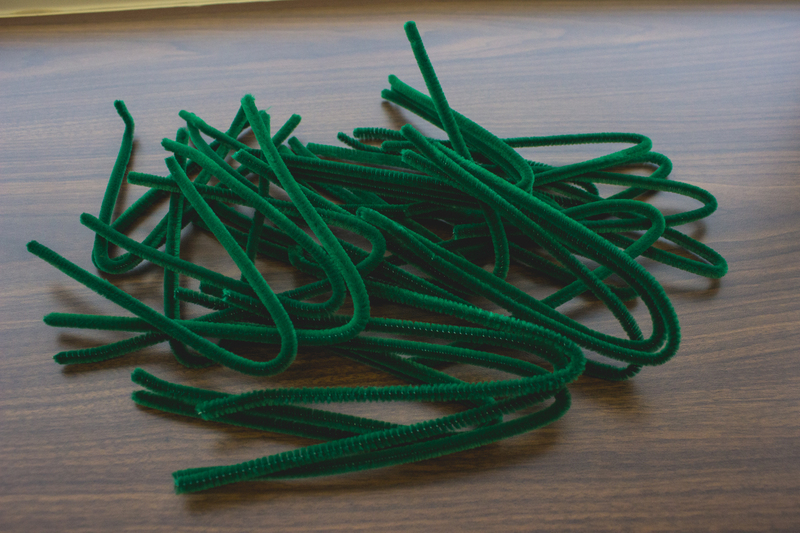 Step 3: Hold the two pipe cleaners so that they create a straight horizontal line. 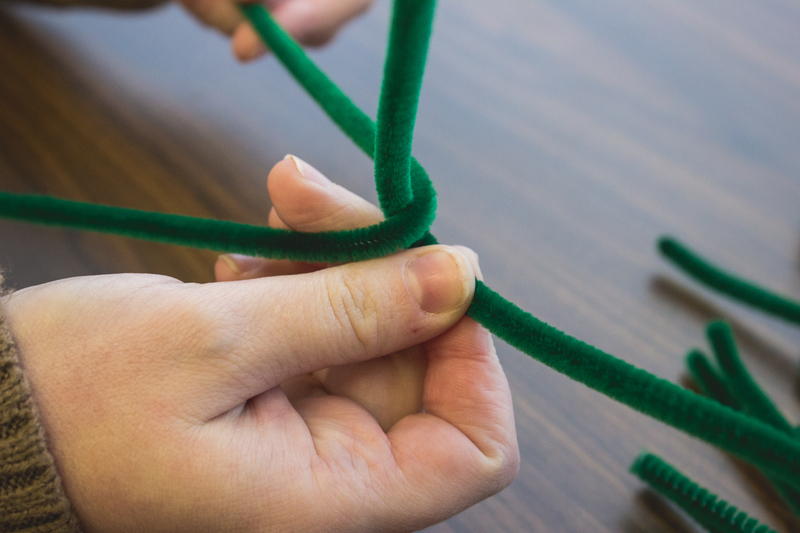 Take a third pipe cleaner so that it looks like an upside-down V and place it so that the pipe cleaner on the left is between the two legs of the third pipe cleaner. 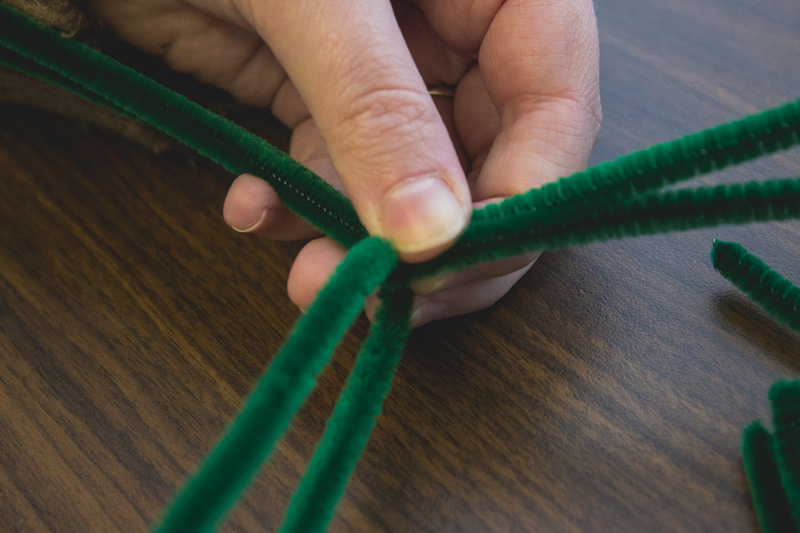 The bottom of the V on third pipe cleaner should be snug against the left pipe cleaner and the bottom of the right pipe cleaner. 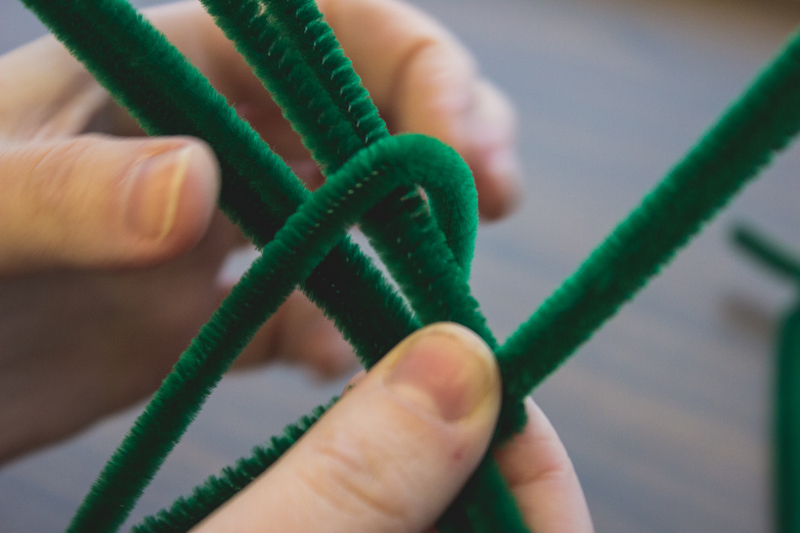 Step 4: Turn the cross clockwise twice, holding the center of the cross so that none of the pipe cleaners move. 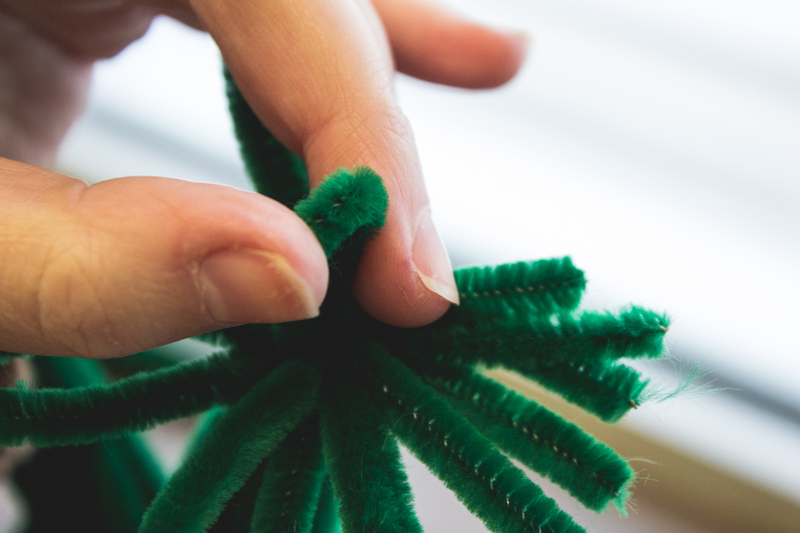 The pipe cleaner that was just added should be pointing up. 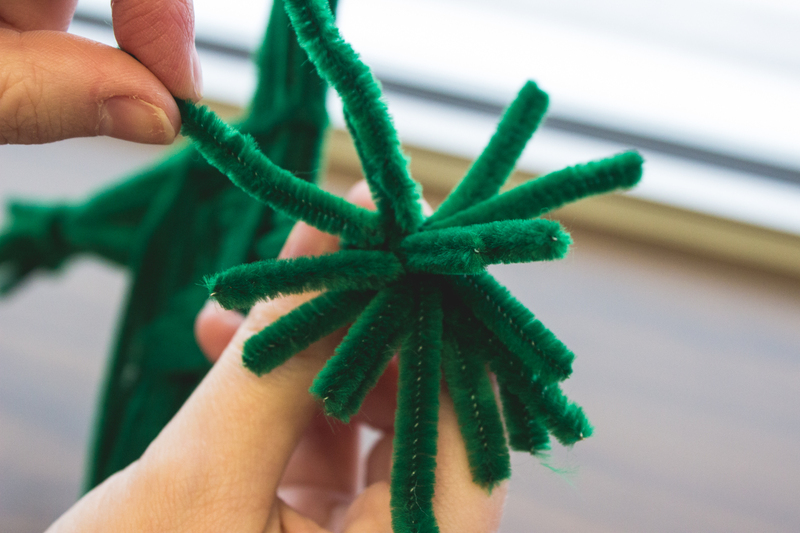 Then add a fourth pipe cleaner with the V pointing down. 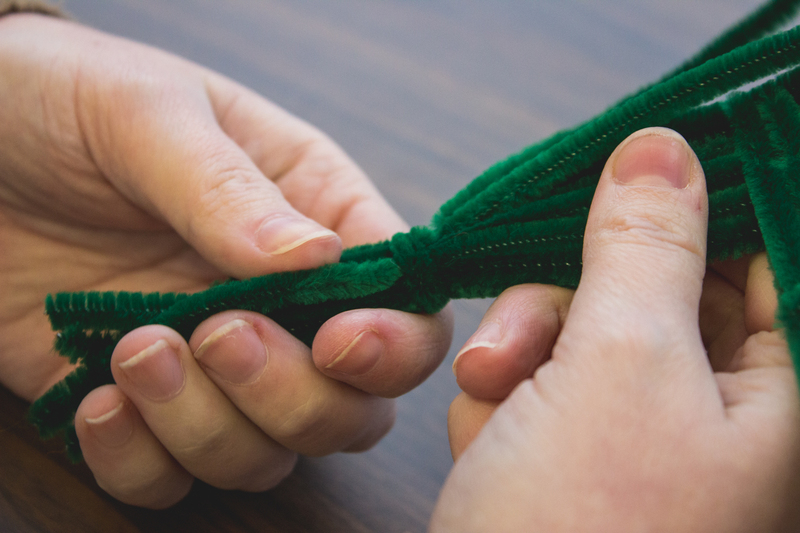 Pinch the end of the fourth pipe cleaner to secure it in place. 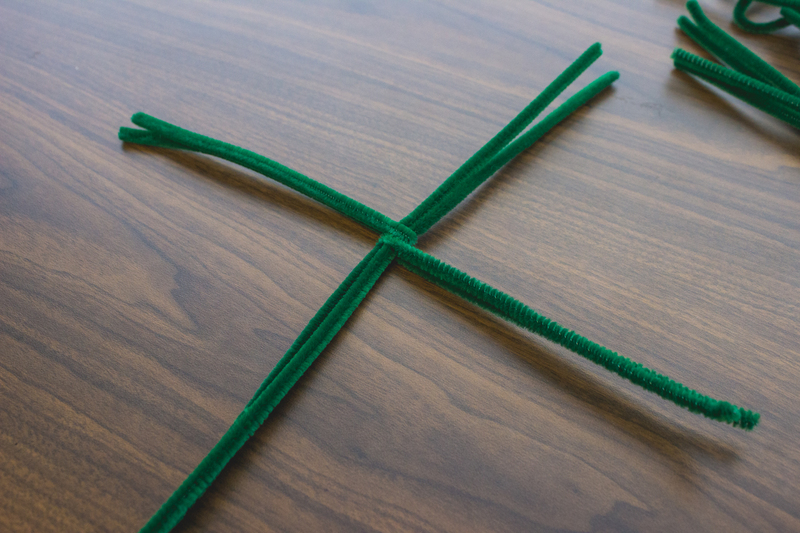 Step 5: Once again, rotate the cross clockwise (just once), holding the center of the cross so that nothing moves. 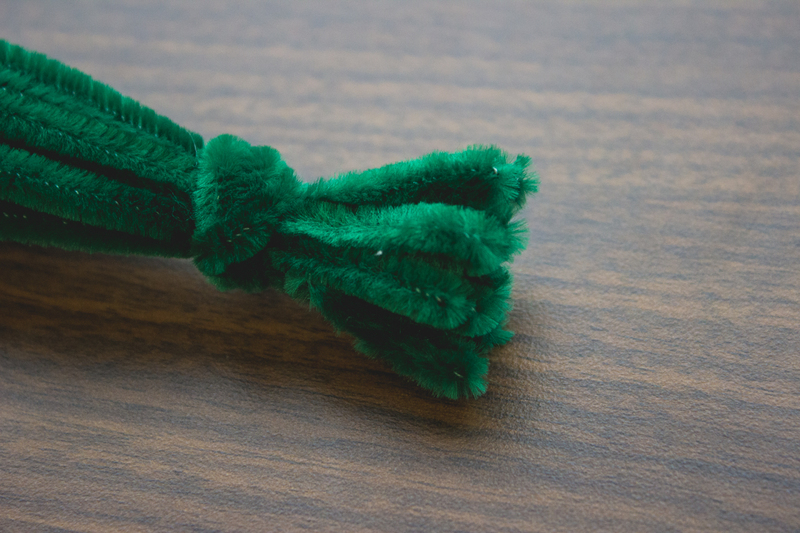 The newest pipe cleaner should be to the left. 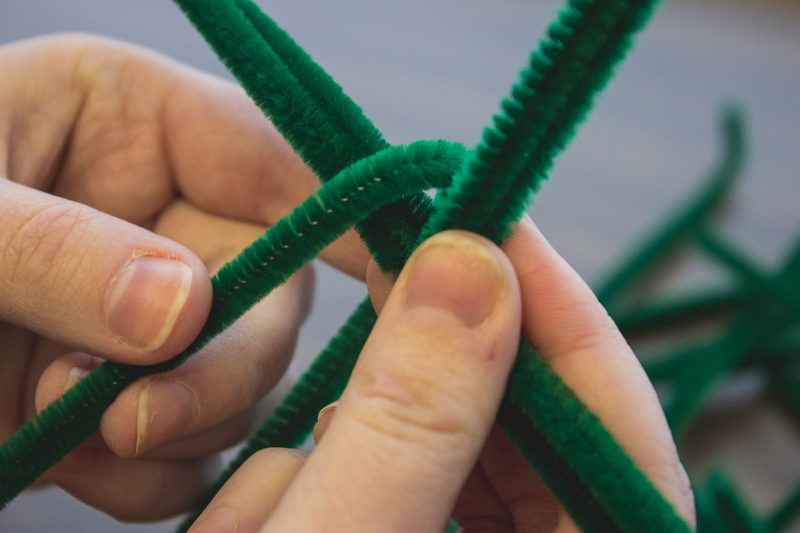 Take a fifth pipe cleaner, and with the V pointing down, place it so that the pipe cleaner on the left is between the two sides of the V. The bottom of the V should be sitting on the left-pointing pipe cleaner and flush against the pipe cleaner to its right. 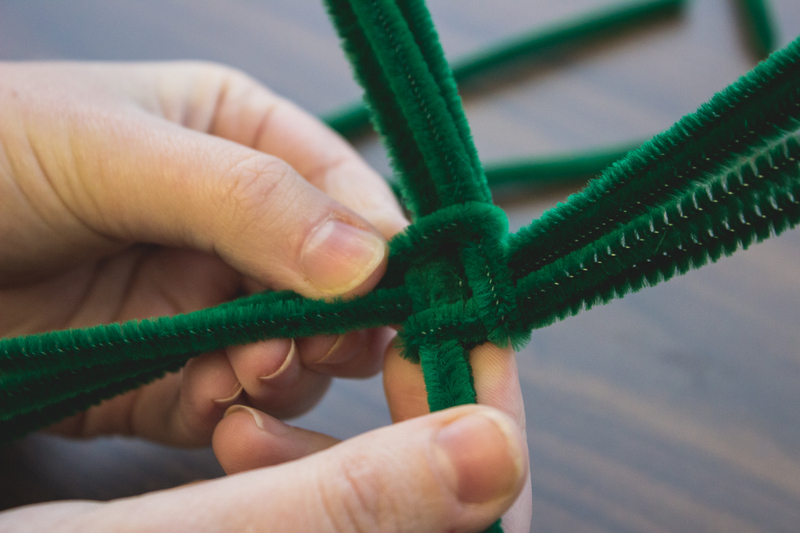 Step 6: Rotate the cross clockwise again and add the sixth pipe cleaner to the left side of the cross, as you did in the previous step. 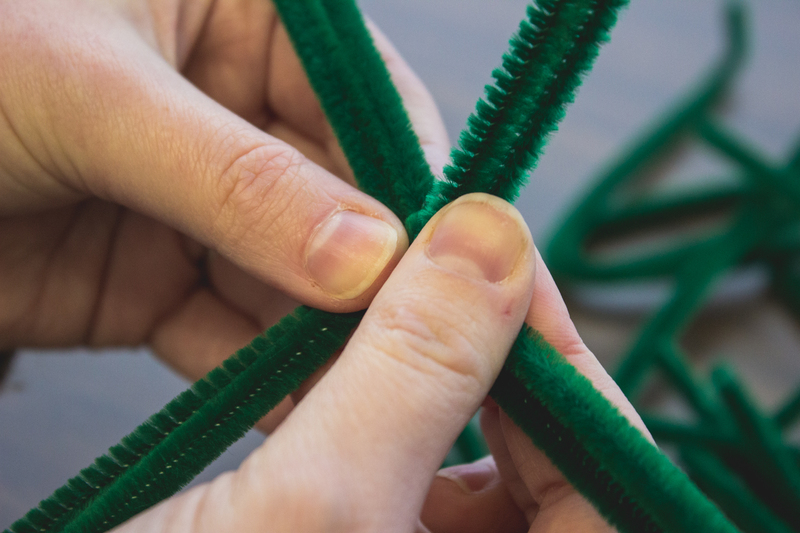 Repeat this process until you have used up all thirty of the pipe cleaners that you folded into Vs, leaving four unbent pipe cleaners. 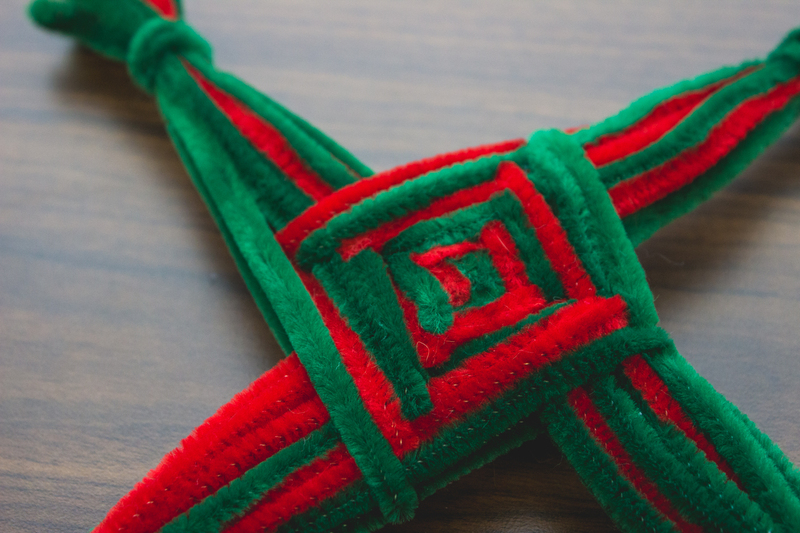 When finished with this step, you should have a cross with a square in the middle and four sides of equal length. 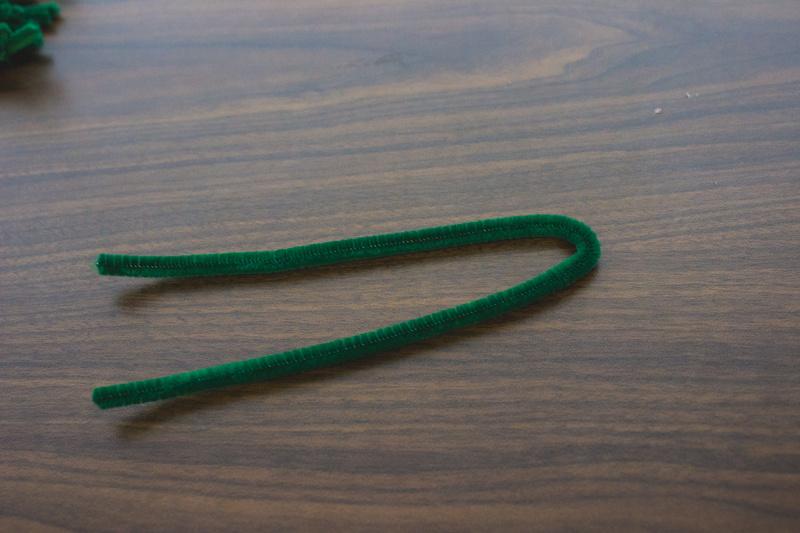 Step 7: Take an unbent pipe cleaner and place it under one of the legs of the cross. 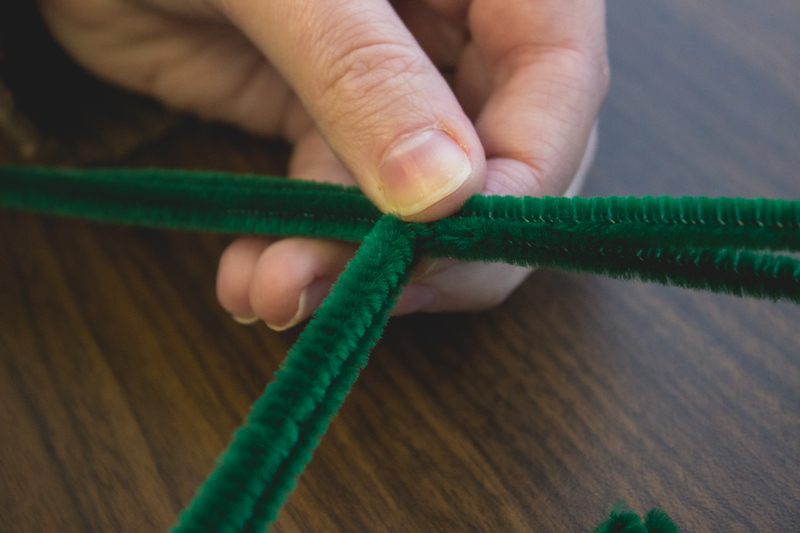 The pipe cleaner should be about one to two inches up the leg of your cross, and you should have about two inches of pipe cleaner exposed on the left and the rest of the pipe cleaner exposed on the right. 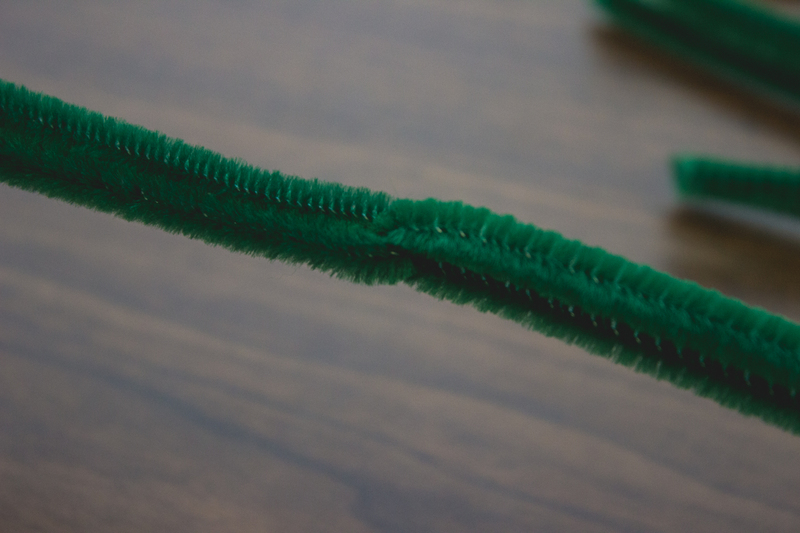 Step 8: While holding the pipe cleaner to the leg of your cross, wrap the long end around the leg twice. 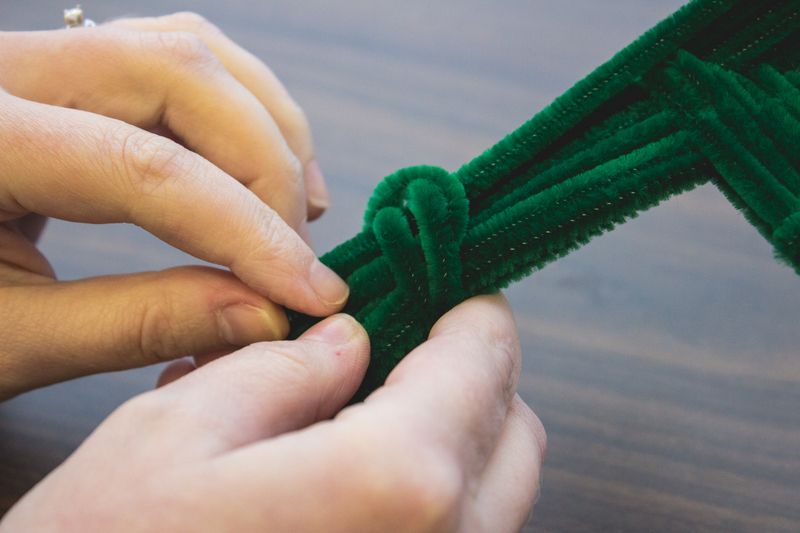 Then take the shorter end of the pipe cleaner, fold it up, and feed it back down through the two loops you just made. 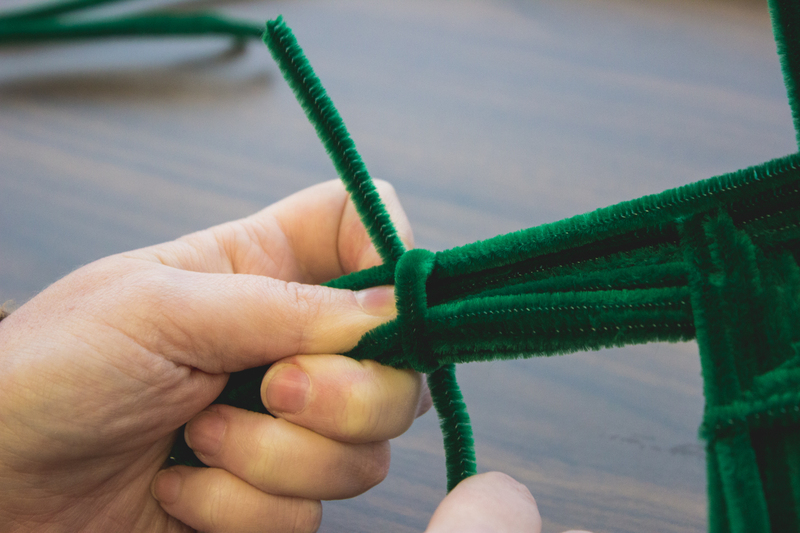 Next, grab both ends of the pipe cleaner and pull them tight around the leg of the cross. 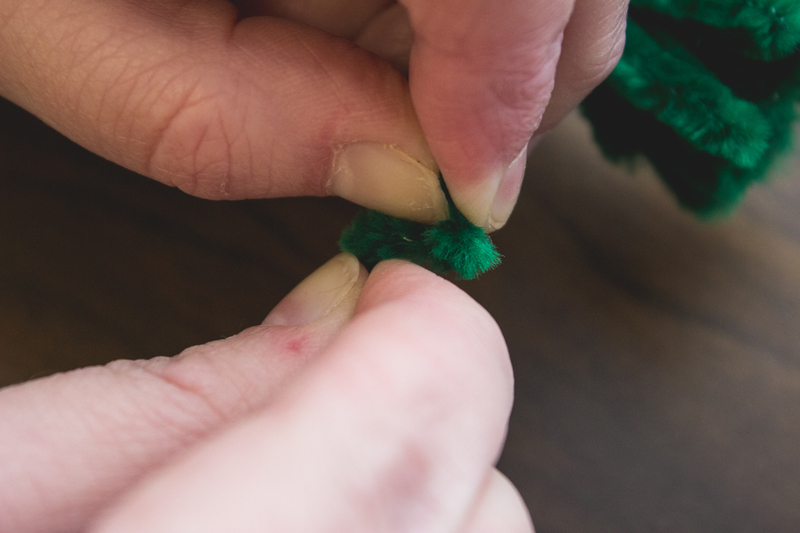 Step 9: Continue wrapping the long end of the pipe cleaner around the leg of the cross until you only have about two inches left. 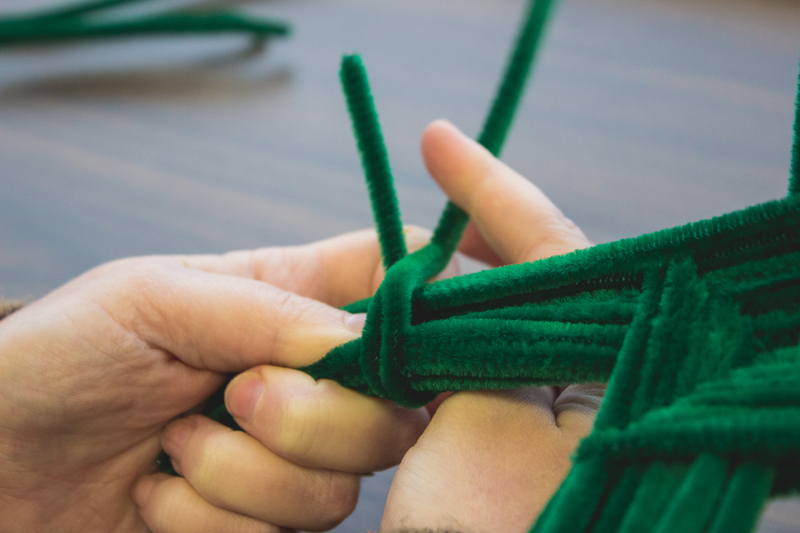 Then feed the end down and through all the loops you just made around the leg of the cross and pull the end of the pipe cleaner to tighten everything up. Step 10: Repeat steps 7 through 9 on the other three legs of the cross. 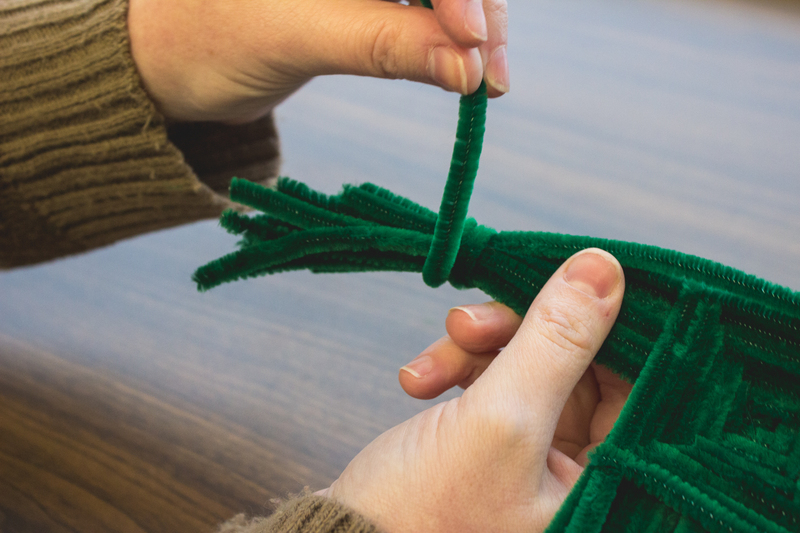 Step 11: Fold the ends of the pipe cleaners that create one end of the cross out, as if you were peeling a banana. 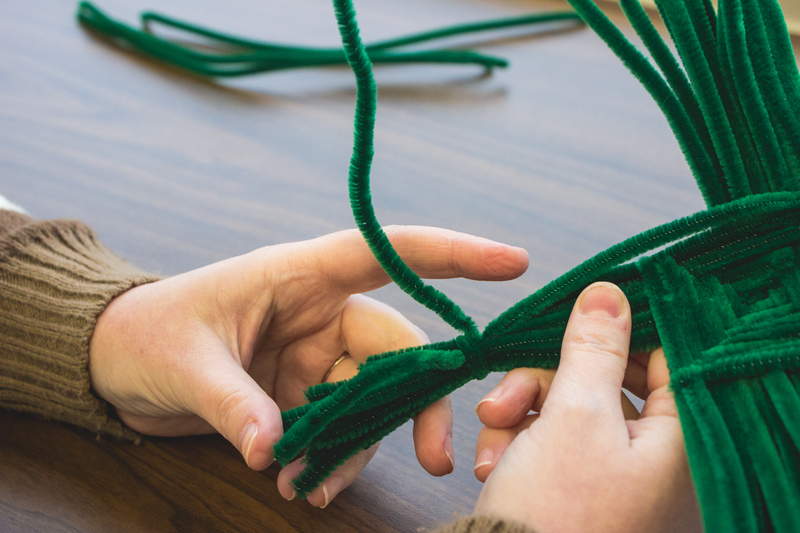 One by one, pull each pipe cleaner end back to the center and fold it down to make all the ends the same length. 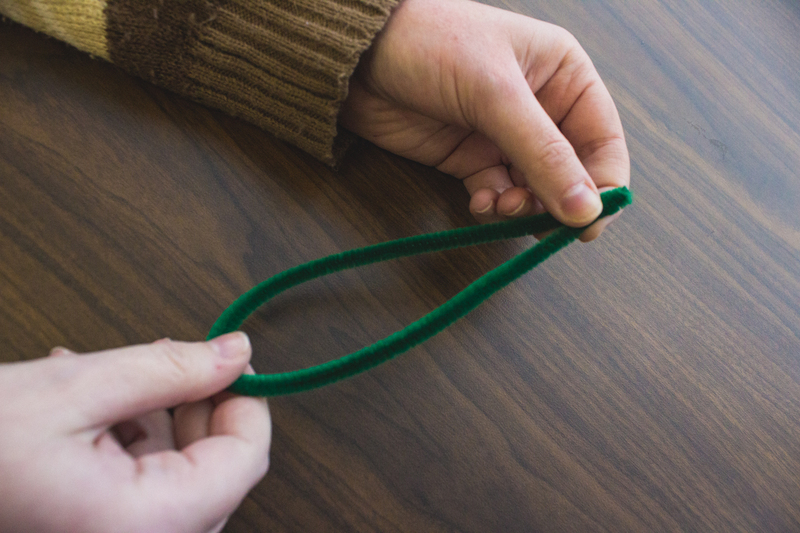 If you have one end that is too long to just fold over, grab it right above where you would like it to end with your left hand, and with your right hand spin the end around in a circle as you would a propeller. After a few seconds, the end should break off. 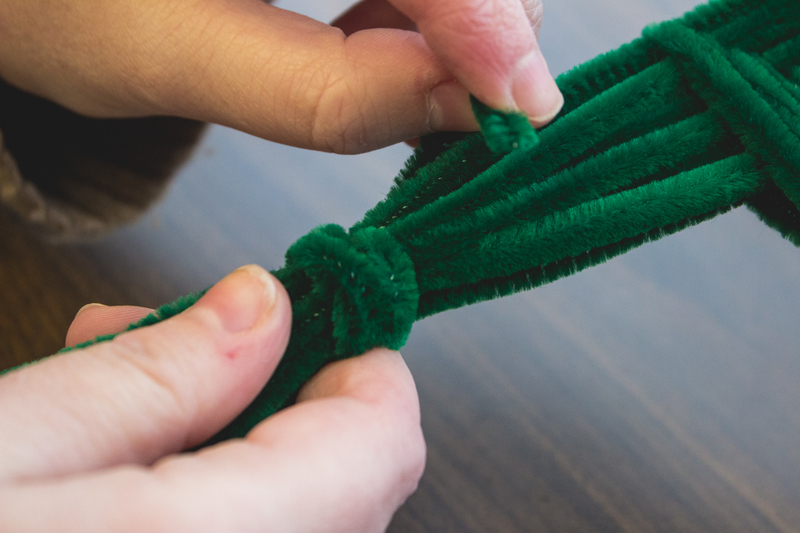 Just remember to leave some extra pipe cleaner so that you can fold it over, getting rid of sharp edges. Step 12: Repeat step 11 with the remaining three legs. You’re all done! 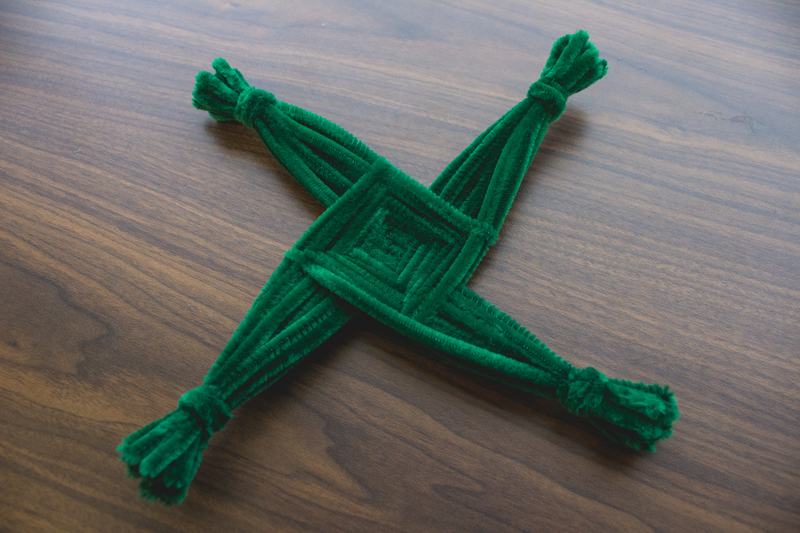 Note: The St. Brigid’s cross is traditionally made from sweet rush (or sweet flag). Sweet rushes are a grass-like plant that is actually not part of the rush family. The herb releases a spicy or lemony scent when the leaves are bent, crushed, or broken. In the Middle Ages, sweet rushes were spread across the floors of castles, homes with dirt floors, churches, and cathedrals. 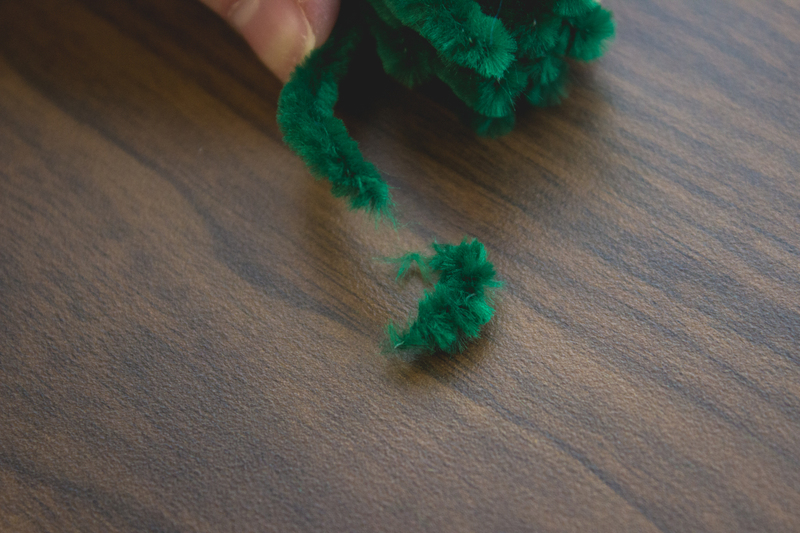 This practice helped to disguise dirt, provide a fresh aroma, and help insulate rooms from the cold.